Convenient - no pre-dilution required. Fast acting formula for removal of aged on oil and grease. Ideal for removal of tar. For cleaning and degreasing of engines and engineering components. Also suitable for the removal of tar and bitumen marks on paintwork. Effective for cleaning up surface residue of oil, and diesel from concrete. Used in garages, service stations, workshops, engineering, transport depots etc. Apply product neat using mop or by spraying on. Agitate impacted grease using a brush. Rinse thoroughly with water. Components can be cleaned by immersion. Allow to soak for up to 20 minutes before pressure washing off with clean water. N.B. 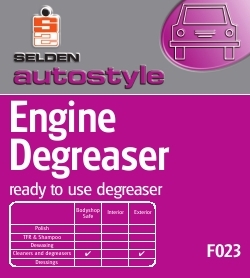 Engine Degreaser should not be used on solvent sensitive surfaces and must be rinsed thoroughly. Composition A blend of refined aliphatic and aromatic hydrocarbons and biodegradable emulsifiers.